Bells Up Winery is a very small boutique producer of Oregon Pinot Noir, Pinot Blanc, and Washington Syrah located in the Chehalem Mountains. 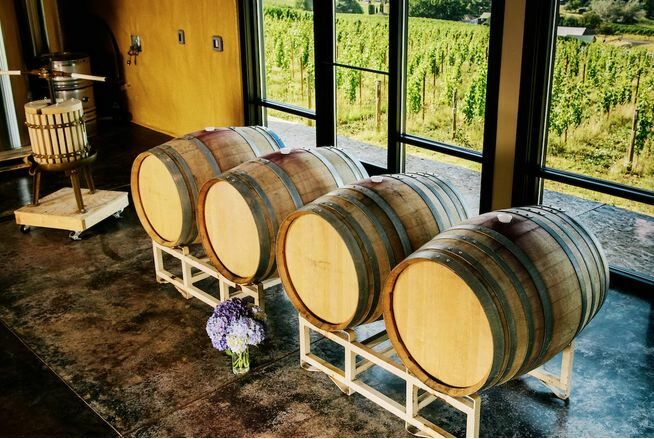 David and Sara Pearson Specter were inspired to open a winery in the Willamette Valley after a vacation at Chehalem Ridge Bed & Breakfast in Newberg in 2008. David began to pursue winemaking as a hobby shortly thereafter, eventually pursuing professional winemaking through a wine apprenticeship at an urban winery in Cincinnati, Ohio, and winning awards at national amateur winemaking competitions. David moved his family to Oregon in the summer of 2012, and together with Sara, acquired a suitable 10-acre site and directed construction of a small winery and tasting room in a former barn on the property. They cleared a south facing hillside on the property and planted 3 acres of Pommard and 667 Pinot Noir clones in 2014, Willamette Valley’s first planting of Syval Blanc in 2015, and 2.5 acres of 113, 943 and Wädenswil Pinot Noir clones in 2016. The winery was established in 2013 and the first wines were released on Memorial Day 2015. The name “Bells Up” comes from David’s French horn playing, with bells up referring to a dramatic moment in classical music where the composer instructs French horn players to lift the bells of their instruments up and project sound with maximum intensity. David played the French horn throughout high school and college, and the winery is his “Bells Up” moment. The Specter’s inspiration for their winery model comes from their nearby mentors at Privé Vineyard, a small winery I have visited several times and one of some renown. The 2014 and 2015 vintage wines were produced from sourced fruit. Production is 400 cases annually. The wines are sold through a mailing list and the tasting room that is open by appointment. The tasting room is adjacent Medici Vineyard. Visit www.bellsupwinery.com.